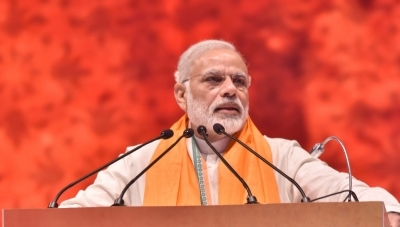 New Delhi, March 20 (IANS): Prime Minister Narendra Modi on Wednesday hit out at Congress President Rahul Gandhi for his "Chowkidar Chor Hai" (watchman is the thief) jibe, saying some people in the last few months have run a disinformation campaign against "chowkidars" (watchmen) for their "vested interests". Interacting with around 25 lakh watchmen via audio bridge technology as part of his new campaign "Mai Bhi Chowkidar" ahead of the Lok Sabha polls, the Prime Minister said the opposition has defamed the watchmen of the country with its "Chowkidar Chor Hai" slogan. "I want to apologise as some people in the last few months have been abusing chowkidars and saying 'Chowkidar Chor Hai' for their vested interests. By doing this, they have questioned the dedication and honesty of the 'chowkidars'," Modi said.